Has it really been over two months since I last updated this blog? Is my travel year really one-third complete? Is 2010 really over? Since I last wrote, I have spent three weeks in the famous Findhorn ecovillage/spiritual community in Scotland, three weeks in the Tamera ecovillage/peace research community in Portugal, and almost three weeks between the Damanhur federation of ecovillages in the snowy mountains of northern Italy and Torri Superiore ecovillage, a restored 13th-century medieval village in the foothills of the Ligurian Alps of Italy. Currently, I am enjoying a Spanish Christmas and New Year’s spent in Barcelona with my friend Monica (who I met in Crystal Waters) and her family. Too much has happened to capture everything in one post, so I will attempt a sweeping overview of some aspects of my travels. I have been writing intensely in my journals along the way, but have been far too busy with the onslaught of new experiences to synthesize my thoughts or capture my impressions in blog form. I have learned, however, that it is better to be doing more living than blogging (sorry to my impatient faithful readers). Blogging can always be caught up with later, at least in theory, whereas the experiences I have when I should be writing are irreplaceable. I am also learning that it may be a good idea to avoid writing about a place until I am leaving or have left, in order to get the fullest possible impression and allow my experience to unfold in its entirety. This is something that my readers can rest assured knowing: my posts may be infrequent, but when they come, they will have breadth, depth, and be well-considered, unlike the more frequent but frenetic nature of something like Twitter updates. So sit back, relax, read slowly, re-read, enjoy, imagine, and ruminate on each word, phrase, sentence, and paragraph. In this way you will read my blog as I have written it and as it is meant to be read – think of it as the Slow Food movement, but applied to blogs. When I told one of the dozens of new companions I met in Melbourne that I would be heading next to Findhorn, he replied: “And now, for something COMPLETELY different!” This comment stuck with me because this was exactly the case. I traveled 40 hours, a total of roughly 11,500 miles (18,500 km for my non-American readers), from southern Australia in Tasmania to northern Scotland via Melbourne, Singapore, Dubai, London, and Inverness. I went from Spring to Fall seasons, from 41 degrees South latitude and 146 degrees East longitude to 57 degrees North latitude and 3 degrees West latitude, from a place where the face of the full moon shows a horizontal bunny rabbit to a place where there appears to be an upside-down bunny rabbit. 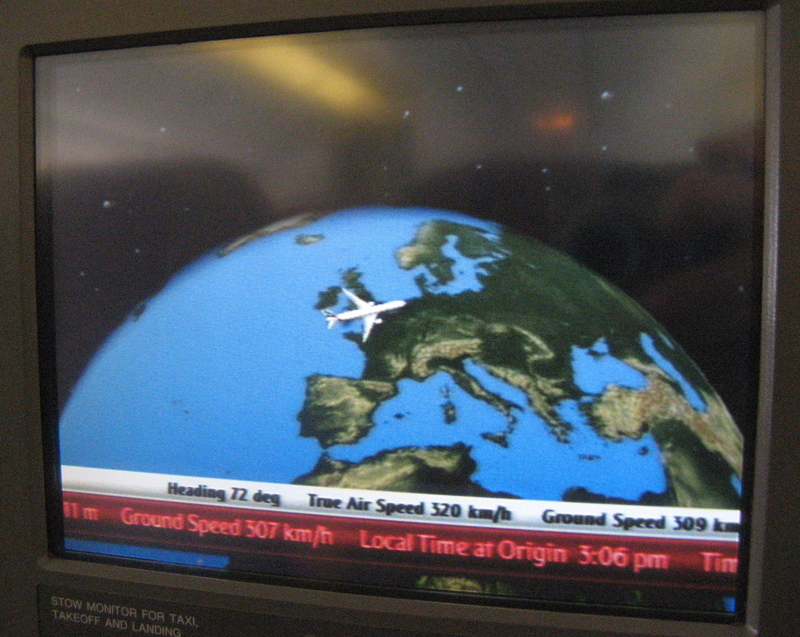 Penultimate leg from Dubai - London. It was intense. The cultural changes were also noted: going from an atheist Permaculture farm to a full-fledged spiritual community. Example: Findhorn celebrates the many small miracles of “manifestation,” as they call them, along their nearly 50-year community history, such as acquiring exactly the right amount of money at the right time to purchase a nearby hotel building to use as a much-needed expanded guesthouse. They celebrate serendipitously meeting other timely financial and material needs through spiritual willing and under seemingly divine auspices. While I was at Bill Mollison’s farm, I told him I would be going to Findhorn and he replied with a story about how he had given a talk to Findhornians in which he called Findhorn a “black hole in the universe of manifestation” because they only manifested things for themselves and their community, while there was a big world out there that could use their help. I suppose that his own lifetime of work in places throughout Africa and other parts of the developing world serves as an example for the kind of manifestation that he was suggesting needed to be done. 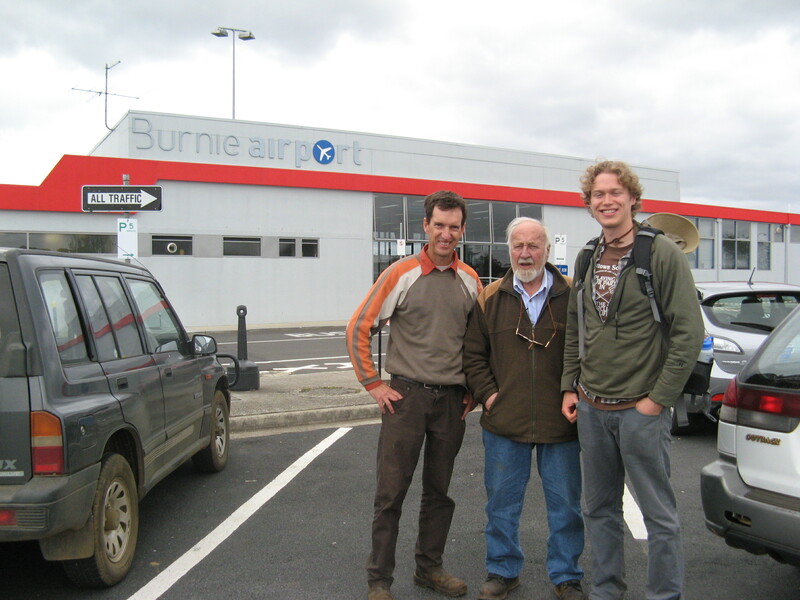 Bill Mollison, the co-founder of Permaculture (center), along with teacher Greg Knibbs and me before my departure from his farm in Tasmania. I thanked him for starting the movement, to which he replied: "I have this feeling of, 'my God, what have I done?'" As many people have pointed out to me, this journey from Tasmania to Findhorn was quite a jump and it would have made more ecological and physiological sense to stop at various points in Asia to see communities there along the way. However, I wanted to attend a Permaculture Design Course in Melbourne from September 20th – October 2nd and an Ecovillage Design course in Findhorn on October 16th, so I had to make this jarring journey in the way that I did. Once more, as with my journey from the States to Australia, it took me a full week to recover from the jetlag, so I have learned my lesson to avoid these kinds of mind-bending/body-draining journeys in the future. Nonetheless, that kind of journey really makes an impression on you with its long transit and intense transitions. I was once again “out there in the world,” being away from the remote comfort of rural ecological communities with their mostly organic food, fresh air, pure water, and healthy ecosystems. I was also away from the social comfort of people with shared values, which was underscored when I found myself sitting next to a Turkish oil businessman on my flight from Singapore to Dubai. He was quite a nice man and we had a relatively lengthy conversation in which I found out that he aspired to study philosophy or social anthropology at some point in his life, maybe after he finishes making his money, and that he had a son who was studying abroad at an American high school in Minnesota through an international exchange program. Whether he was aware of how destructive and deleterious his industry is to our planet, I don’t know. Maybe he was another example of someone who understood the downsides of his career, both for him personally and for environment/society generally, but undertook it anyway because of the financial imperative of our society… I didn’t have the courage to ask. I saw firsthand what an incredibly vast, incredibly varied, and incredibly complex place our world is, whether you are talking about human society or landscapes/ecosystems. 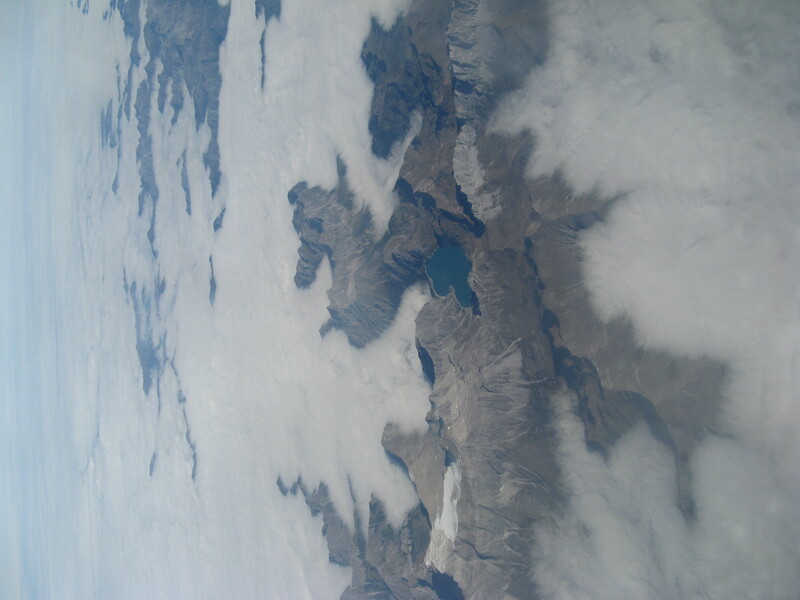 I saw a range of human society, both up close and from above, in all its splendor and squalor, in all of its cultural diversity and developmental homogeneity (transport infrastructure and styles of development are mostly indistinguishable from one another whether you are in Melbourne, Singapore, Dubai, London, or any other global metropolis). I sat in the consumerist nightmare that is the Dubai airport and was one of the few white faces there, keenly aware of my minority status. There I began to understand just how large the human population is and attempted to comprehend its collective effects on climate and ecosystems. 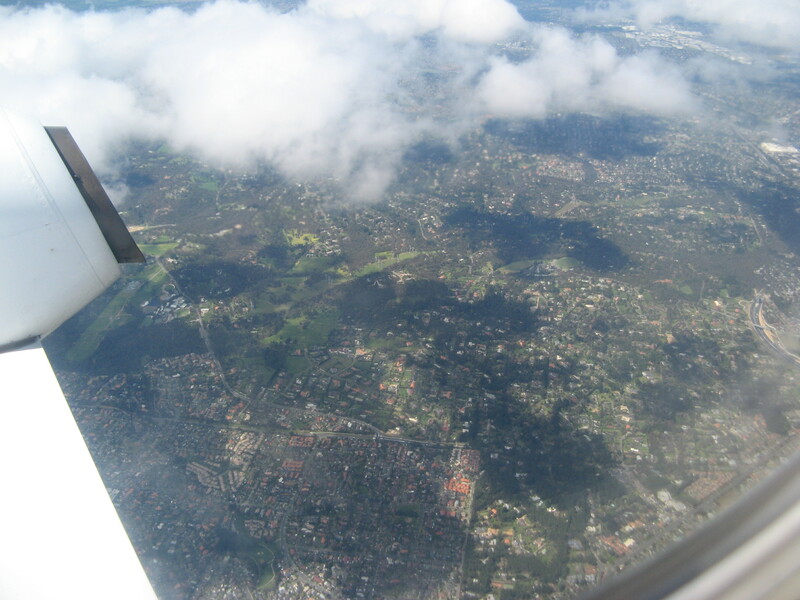 God's eye view over Melbourne at no extra charge. Another strategy of embrace is justification. One way to justify this is utilitarian: that my potential for global environmental benefit by visiting these places is greater than the global environmental harm inflicted by visiting them. 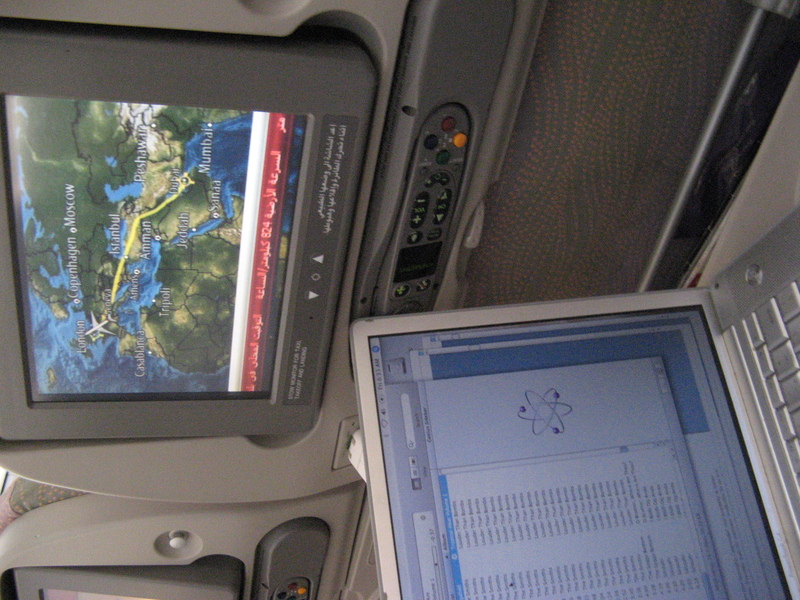 A second justification could be called the “best use” scenario: if the planes are going to be flying whether or not you use them, which they are, you might as well hop on them for a purposeful exploration of the world (i.e. with the intent of transforming yourself and the world) rather than, say, Spring Break partying. In other words, while fossil fuels are still cheap and available (neither of which will be the case for very long), you might as well put them to the most important possible use. A third justification is something I came across while in Australia called the Transition ethic. I learned from an inspiring young Canadian Permaculture teacher named Delvin Solkinson that the Transition ethic is a fourth Permaculture ethic employed to supplement the to supplement the original three Permaculture ethics of care of People, care of the Earth, and fair share of abundance. The Transition ethic, as written by Delvin, states: “in times of transition it is okay to use unsustainable means when creating a sustainable system. For example there is a machine for use to dig a hole, it might make more sense than spending hundreds of human hours hand digging it. Likewise if we have left over paint it might be wiser to use it up instead of garbaging it and purchasing expensive new eco-paint. The goal is not to use unsustainable technologies, but the reality is that this is okay when in transition” (http://www.gaiacraft.com). More than these justifications, however, I am learning to look at things from several different and complex perspectives, including perspectives outside the traditional environmentalist worldview. For example, from one lens, fossil fuels are a blessing that have allowed us unprecedented advances in knowledge, materials, and even health. You and I probably wouldn’t exist without them: I remember reading somewhere that roughly ¾ of the world’s population wouldn’t have been born without the discovery and rampant use of fossil fuels starting with the industrial revolution (does anyone know the source of this statistic? I think it was connected to a discussion of the so-called Green Revolution, possibly in Michael Pollan’s Omnivore’s Dilemma). Talk about miracles of manifestation! One such machine of power multiplication is a computer. That is incredible enough, but then you have the emergent level of millions of connected computers (and accompanying humans) that is the internet. It is impossible to comprehend the embodied amount of energy and knowledge and information in the internet! Just imagine what the world would be like if we each and collectively used this UNWIELDY amount of power for good. Another example of using possibly deleterious energy/technology for good would be consciously using planes to expand your consciousness, global consciousness, and with this increased awareness transition the world towards healthier technological, economic, political, social, industrial, and personal systems. That is to say: a healthy human ecology. so much more power than ever before. Use it well. “Here I am on this seemingly interminable journey from the very south of Australia to the very north of Scotland. The long-leg transits are seemingly interminable but also very temporal, just like my Watson year itself, one-sixth of which has already elapsed. 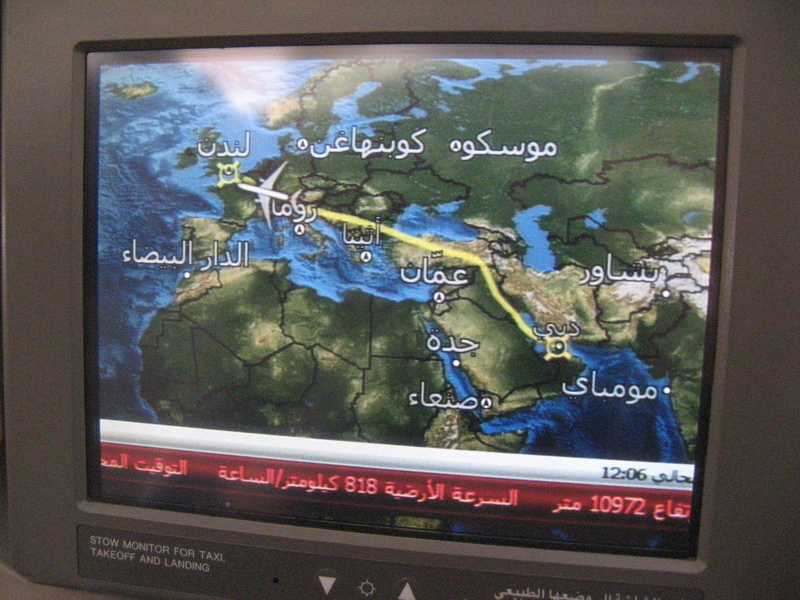 I am on the penultimate plane leg, having traversed Tasmania – Melbourne, Melbourne – Singapore, Singapore – Dubai, and now Dubai – London before I head from London to Inverness, Scotland. From Inverness I take a bus to Forres, where I will have my first official CouchSurfing experience with an interesting man named Torsten who grew up behind the Iron Curtain in Germany. He has since traveled the world widely and been impressed by the unrelenting kindness, hospitality, and intrigue of all those he met along his way; he now wishes to return those favors by hosting travelers himself. The CouchSurfing experience was interesting indeed. Torsten picked me up in Forres at 6 p.m. in his giant tourism business van (“Experience Scotland Differently” emblazoned on the side) and took me back to his farmhouse. He was a very lively and amicable chap, engaging me in vibrant conversation, which I did my best to reciprocate despite my fatigued state. He offered me coffee and snacks and we conversed for a while. I received fascinating perspectives from him on Findhorn, as he had lived in the community with a wife and child for two years before they separated and he left. He had problems with community members who thought they knew the best, most spiritual way for him to live. He told me that he had enough of people knowing the answers to the right way of living when he was behind the wall in Germany and that he felt a GDR vibe in Findhorn. Though I probably should have crashed at this point after 40 consecutive hours of transit, Torsten asked if I wanted to go out to the pub with him and some of his friends. I heard him say that one of his friends would be playing music there. Feeling unreasonably awake at that moment and abiding by my decision to say yes to every new experience possible, I said sure, why not? Normally I would not have gone for this, but as the truncated Gandhi quote on the Watson guiding philosophy card reads, “The best way to find yourself is to lose yourself…” The part they left out was “in the service of others.” Perhaps a more relevant quote would be: “One does not discover new lands without consenting to lose sight of the shore for a very long time” – André Gide. Basically, in order for this journey to have the maximum transformative effect on me, I am trying to put myself into situations that I would not normally be completely comfortable with in order to expand my horizons. The pub turned out to be nothing more than a pseudo-club at which his friend was deejaying, which was nothing I hadn’t seen before in a place where and at a time when I didn’t want to experience that. However, I suppose I did get a sense of (one particular subset of) the local population. Most importantly, through Torsten I met an awesome young guy named Alex who is involved with Permaculture projects in Mexico City! I have been blown away by all of the switched-on young people who I have been meeting in droves during my travels. I am going to craft posts on amazing and inspiring youth, featuring interviews with a few of them. We ended up staying way longer than we should have, getting home at 3 a.m. The next morning, my alarm didn’t go off at its intended 10 a.m., but luckily Torsten woke me (“are you dead?”) and offered me a fresh cup of coffee. Between the jet lag and the late night, I was fairly obliterated, but I did my best to grab a bite to eat and get my things together before he drove me to Findhorn. All things considered, the late night at the pub-club was probably not the best way to start my Findhorn experience, but it was the first of many contrasts that made my visit all the more interesting. I will detail my Findhorn experiences in a future post, but for brevity’s sake and to stick to the themes of this post, I will here only outline a few of the interesting contradictions that I observed and experienced. One is that Findhorn, a famous international mecca of ecospirituality and peace, is located next to an air force base, which I found out on my first day there. I was looking at their wind turbines, when all of a sudden to my complete astonishment a fighter jet took off and ripped through the air! “What is that?” I asked. “A Scottish Royal Airforce base,” someone replied. “Are you serious?” I asked in disbelief. Why had no one told me this before? This juxtaposition made no sense to me; it was too blatant and drastic to be true. 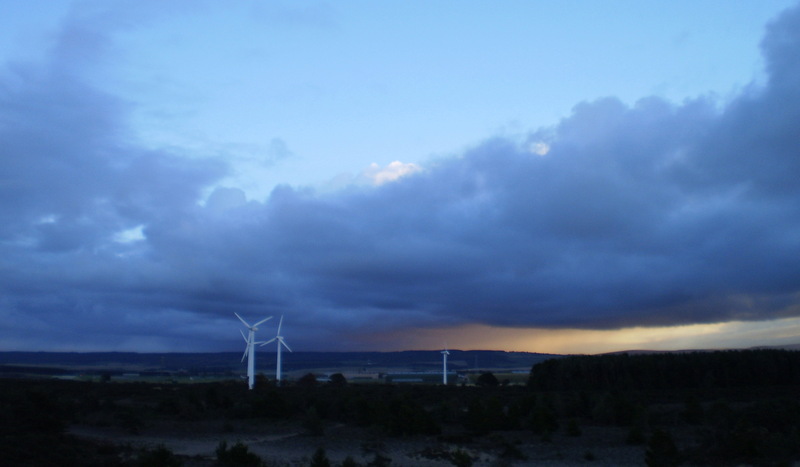 wind turbines at Findhorn. Airforce base lies just behind. Once our masks were complete, fastened to our faces, and we had gotten into the character of our chosen being by hopping, scurrying, slithering, barking, swaying, or whatever the appropriate behaviors may have been, we began a somber single-file procession to the fire circle out in the sand dunes. While we were in the circle, we each introduced ourselves along with the concerns of the species we were representing. There was quite a gravity to the situation; many non-human beings of the world are imperiled, after all. During the speech of my favorite character “one-eyed stray cat,” as played by my wonderful friend Val, the ever-skeptical atheist Bulgarian man, a fighter jet tore through the air above our heads, probably breaking the sound barrier at Mach 3 and completely drowning out our dialogue. Finally, I remember going on a walk one evening before sunset. I set out through the woods and felt a serene feeling come over me as my solitude and the cool damp canopy of the pine forest enveloped me. Thoughts and reflections began to emerge. A few steps in, I started noticing orange markers on the trees. Then, I started noticing that the trees were planted in rows at regular intervals. I realized that the pleasant natural environment in which I was finding rejuvenation was most likely a lumber plantation that was planted solely to be harvested for wood. I enjoyed my walk anyway, perhaps even more after having this contradictory revelation. Fossil fuels have ironically and in a roundabout way brought us closer to understanding just what our role as a species in ecosystems is: though we have been the facilitators of systematic and systemic global environmental degradation, we can become (and are recognizing that we need to become) healers of ecosystems and facilitators of abundant living systems for ourselves and the rest of life on Earth. Similar to the way in which we learn from every experience, good or bad, the mixed blessing of fossil fuels has taught us many things at great ecological and health expense, including that we have to find a different basis for our civilization if we hope to live healthy lives in healthy environments into the indefinite future. Interestingly enough, the airforce base is being shut down because of the economic crisis. Some may be prone to celebrate, but this means the loss of about 5,000 jobs and a potential economic crisis in the region. Apparently the airforce base provides two-thirds of the jobs in the region, while Findhorn accounts for the other third. There are actually representatives from Findhorn meeting with regional government to discuss local economic responses to this emergency situation. Thus, Findhorn may have an important hand in redesigning the local economy! I will get more information on this for a future post.